OPEN SWIM: All Ages: Section of the pool made for swimmers. LAP SWIM: 18+ only: Lanes designated for lap swimmers. Swimming is only permitted when the facility is open and lifeguards are on duty. All persons must shower with water before entering the pool. Personal flotation devices must be Coast Guard approved and used with an adult swimmer within arms length of the swimmer. Urinating, spitting, blowing the nose, spouting of water, or depositing foreign matter into the pool is prohibited. Boisterous or rough play, shoulder rides, dunking, and running is prohibited. No jumping or diving is permitted from anywhere in the pool or off the pool deck. Playing or hanging on lane lines and safety buoys is not permitted. No person under the influence of alcohol or drugs will be permitted. Abusive or profane language will not be tolerated. Swimmers using offensive language, tones, or gestures will lose their swimming privileges. Staff is not responsible for valuables. You are encouraged to bring a lock to secure your personal items in a locker. Locks must be removed daily, if left overnight they will be removed. Anyone under the age 12 must take a swim test. It is mandatory that all children under the age of 12 wear a level identification band. No food or drink in pool area. All training equipment including kickboards, buoys, gloves, etc. are to be used only by adults or during supervised instruction. Swim suit and towel are required in order to swim. No shorts and/or tee shirts will be permitted. Any child 12 and under must be accompanied by an adult. Any child under the age 6 must be accompanied by an adult in the water. Parent must remain within arms reach. No cell phone use in locker rooms. Patrons must obey and respect the lifeguards at all times. All rules must be followed. In case of violation of any of these rules, patrons will be asked to leave the pool. Aqua Zumba® is the "pool party" workout for all ages. This safe, effective and challenging water-based workout integrates the Zumba® formula and philosophy into traditional aqua fitness disciplines. Aqua Zumba® is low-impact, cardio-conditioning, body-toning & fun, making it a great class for all fitness levels. Join instructor Lizz for this fun pool workout! American Red Cross Adult Swim is intended for teens and adults who wish to improve their knowledge and skill for many reasons. It may be to overcome their fear of the water and to learn the basic skills, achieving a minimum level of water competency; or perhaps to improve their skill and technique to increase their level of safety; to improve their health and fitness; or to perhaps compete in triathlons or to join a masters team. Adult Swim Basics - Learn basic swimming skills to keep yourself and others safe in and around the water. Adult Stroke Improvement - Students will gain proficiency and skills in the six basic swimming strokes. 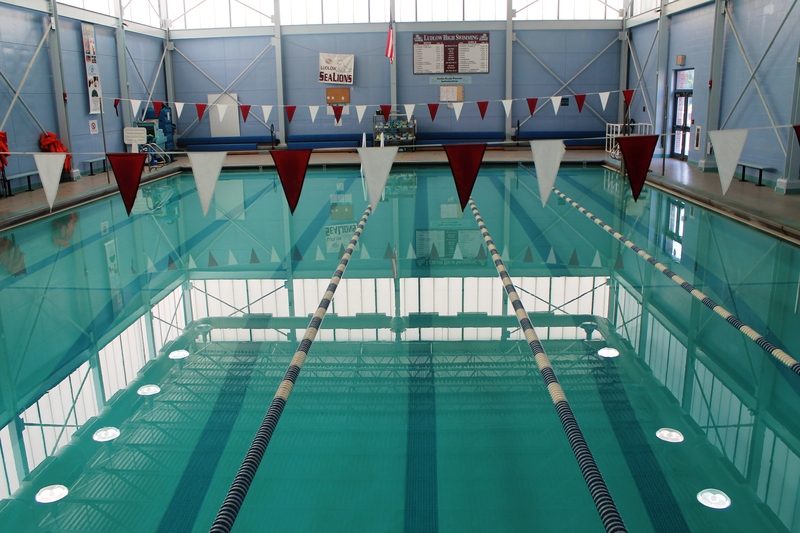 Private Swim Lessons are available for various times and days. We offer morning and night lessons as well as some weekend hours. All lessons are a ½ hour long, 1-on-1 with instructor. All lessons must be scheduled 1 week in advance. Please contact the Aquatic Director to schedule your lesson. Tone and sculpt your body with no impact to your joints. This popular water aerobics workout is a swimming blend of cardio and resistance training, and may incorporate resistance tools such as buoyant water weights and noodles.